For the 2016-2017 academic year, there are exactly 408 Black male undergraduates at the University of Virginia, being less than 3 percent of the total student population. Four hundred and eight — a number high enough making it hard to know everyone but low enough causing surprise when you meet a new Black man that is not a first year. Although, in-state students may not be so shocked. Comparing the high school graduates in Virginia (2013-2014) to University enrollment (2014-2015), 8 percent of the student population was Black in this state where 22 percent of public high school graduates are Black. This is an issue facing many of our nation’s flagship public universities. To correct this issue, we as students mentoring in the Charlottesville community and back home should paint a picture of encouragement of changing the racial climate rather than push them elsewhere. This task does not fall on students. Rather, administration should seek more applicants and provide retention support once Black students enroll. What does the University do in regards to the Black males that accept admittance? Let’s look at the Black male experience on Grounds in three facets: achievement, involvement, and relationships. The Office of African-American Affairs (OAAA) displays their efforts in contributing to the University having the highest graduation rate for undergraduate Black students at a U.S. public university for the past twenty years. This feat is quite remarkable. However, retention must be coupled with academic performance. That is to say, new students must be transformed into better students over four years and have solid grades to obtain a job in their desired field. Every year, OAAA honors the Black first-year class with Harambee II High Honors and Honors for those who receive over a 3.40 and 3.0 GPA their first fall semester respectively. Of the 85 High Honors, 28 percent (24 of 85) were male. Of the 101 Honors, 30 percent (30 of 101) were male. In other terms, for every 1 first-year Black male having a 3.0 or better there were 2.44 Black females. This year’s Harambee II awards highlight that Black women are outperforming their male counterparts from the very beginning. Currently, there are six active student organizations geared specifically for the Black male. There is just one more Black male specific organization than Black female specific organizations. The Collegiate 100 Society (C100) and the Luther P. Jackson Black Male Initiative (BMI) are not as exclusive to Black males. While C100 does have an application process, it seems it’s not rigorous in regards to ensuring that Black men will be good mentors at the local Charlottesville high schools. BMI accepts all Black males that attend their general body and book club meetings. All six organizations share a similar mission to transform their Black male members into better men while uplifting their community. The remaining four are Black Greek-lettered fraternities (BGLFs): Iota Beta Chapter of Alpha Phi Alpha, Lambda Zeta Chapter of Omega Psi Phi, Eta Sigma Chapter of Kappa Alpha Psi, and Zeta Eta Chapter of Phi Beta Sigma. 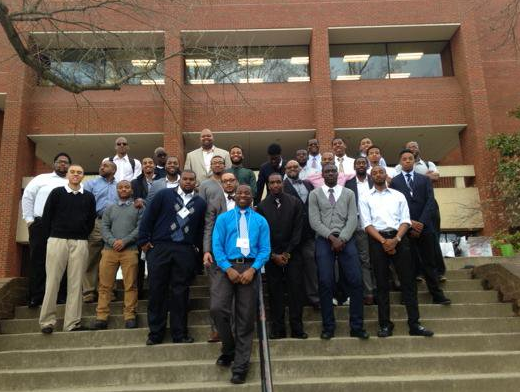 In total, there are 24 Black male Greeks. Membership in BGLFs is 6 percent of the Black male undergraduate population. In my experience being President of the Iota Beta Chapter of Alpha Phi Alpha, the overall cost, initiation and attending conferences, deters interested candidates. This financial burden is a critical determining factor in one’s initiation and active participation. These conferences’ leadership development and networking opportunities are unparalleled to any specific University program ran through the Office of Fraternity & Sorority Life. However, no administrative financial resources aid Black Greeks to attend such conferences. “There aren’t enough good Black men at this University,” a statement expressed to me by many of my Black female peers. Four hundred and eight. The achievement gap, as mentioned earlier, doesn’t help the cause of living up to the academic standard of female peers. From personal experience, a running assumption is that there are 2 Black women per every one Black male. The ratio is actually closer to 1.5 Black women per Black male. Oftentimes,from my experience, an interaction with a single or couple of Black males leads to a greater generalization of how Black males treat their female peers. In the greater community, Black male leaders become the voice for the Black male experience on Grounds to white peers and administration. The hope is that administration realizes what is occurring and seeks out a vast variety of voices. The hope is that University officials are doing everything within their role to better the experiences of all Black students on Grounds. My thesis on the Black male male experience on Grounds and personal relationships with Black male peers will be discussed in future Orphee Noir articles. My involvement has pushed me to leave a better experience for the Black males that will follow me on Grounds. I hope to accomplish such through these written pieces and organizational involvement. This entry was posted in Opinion, Trending and tagged Black Men in Higher Education. Bookmark the permalink.